In the penultimate match-up of the First Round, two women square off with the winner taking on Harriet Tubman. Thérèse of Lisieux, the original flower child, takes on Martha of Bethany, Biblical disciple. Yesterday Gregory the Great defeated Martin of Tours in the Battle of the Bishops and will face Florence Li-Tim Oi in the next Round. We understand that, in an act of deferential concession, Martin then sliced his miter in half. While experiencing nervous tremors as a young girl, Thérèse of Lisieux (1873-1897) believed that she saw a vision of the Virgin Mary and was healed. She described this to Carmelite nuns, whose questions filled her with self-doubt and caused her to believe, wrongly, that she had lied about it. Several years later, on Christmas Eve 1886, she had what she said was a “complete conversion” as love entered her heart and liberated her to serve others. The next year she told her father about her desire to mark the first anniversary of that conversion by joining the Carmelite nuns before Christmas. He picked up a little white flower with its roots and gave it to her. He said that God had created it and cared for it. Thérèse, who would eventually become known as “The Little Flower,” believed that to be a metaphor for her own life and that she would be planted in different soil. Yet she was still considered too young to be planted in the soil of the Carmelite nuns. Later that same year, on a pilgrimage to Rome, she knelt before Pope Leo XIII and asked him to allow her to enter that religious community. He blessed her but left the decision in the hands of its superiors. She stubbornly remained there and had to be removed from the room by the Swiss Guard. Finally, however, she was allowed to become a Carmelite postulant at the age of 15 and moved into a cloistered community in Lisieux, which is located in northwestern France. 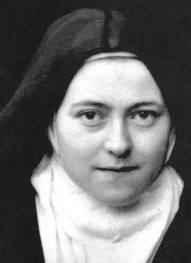 Thérèse made her religious profession there at the age of 17. She finally had the life she wanted – a life dedicated to prayer. So it’s interesting to note that she frequently fell asleep while praying and was embarrassed that she couldn’t stay awake in chapel with her religious community. But she realized that parents love their children while they sleep just as much as they do when they’re awake. In the same way, she knew that God loved her. Chapel presented other challenges too. One of the nuns made clicking noises in that setting that drove Thérèse nuts. She might have been playing with her rosary. She might have had bad dentures. Whatever the true cause, it was simply maddening to Thérèse. But Thérèse decided to make it into a kind of music and offer it as a prayer as she sat there in the presence of God. Those are both examples of her “little way” of being a Christian. After Thérèse’s death from tuberculosis at the age of 24, her writings were collected and published as The Story of a Soul. That’s how the world came to know and love her. O God, by whose grace Thérèse of Lisieux became, with the fire of your love, a burning and a shining light in your Church: Grant that we may be inflamed with the same spirit of love, and ever walk before you as children of light; through Jesus Christ our Lord. Amen. Though Martha of Bethany is mentioned in only two places in Scripture (Luke 10:38-42, John 11-12), she has had a lasting impact, for good and ill, on our conception of the spiritual life. It is sometimes hard to remember that Martha is a person and not a type. But, as one commentator puts it, “She looks at us out of the pages, a curiously vivid personality; downright, honest, practical, unselfish” (Interpreter’s Bible 1952, Volume 8, p. 636). Martha is a devoted sister, never mentioned except alongside one or both of her siblings, Mary and Lazarus. Whether Martha is the oldest in the family is uncertain. However, Luke makes it plain that Martha invites Jesus to her house for that fateful meal when Jesus takes her multitasking to task. “Tell my sister to come and help me,” Martha says. 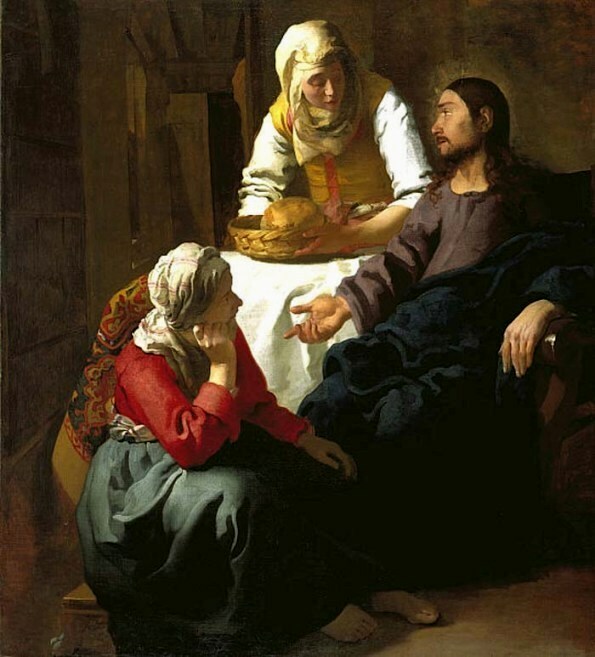 In reply, Jesus speaks to Martha’s inner state rather than the presenting issue: “you are worried and distracted by many things; there is need of only one thing.” Martha, who had sought to serve Jesus and wishes for Mary to do the same, is instead invited to be served. John reports that when Jesus arrives at Bethany after the death of Lazarus, it is Martha who first goes out to greet him. They engage in a conversation in which Martha’s statement of Christ’s ministry rivals the Confession of Peter. Jesus said to her, “Your brother will rise again.” Martha said to him, “I know that he will rise again in the resurrection on the last day.” Jesus said to her, “I am the resurrection and the life. Those who believe in me, even though they die, will live, and everyone who lives and believes in me will never die. Do you believe this?” She said to him, “Yes, Lord, I believe that you are the Messiah, the Son of God, the one coming into the world” (John 11:23-27). Martha seems to take these rebukes in stride, continuing in her faithful discipleship and love of her Lord. In the final mention of Martha in Scripture, John 12:2, Jesus again joins the beloved siblings for dinner. Lazarus is at table; Mary anoints Jesus’ feet with perfume. And Martha served. Generous God, whose Son Jesus Christ enjoyed the friendship and hospitality of Mary, Martha and Lazarus of Bethany: Open our hearts to love you, our ears to hear you, and our hands to welcome and serve you in others, through Jesus Christ our risen Lord; who with you and the Holy Spirit lives and reigns, one God, for ever and ever. Amen. 162 Comments to "Therese of Lisieux vs. Martha of Bethany"
I grew up with a dislike of Theresa, owing to the fact that she was held up as a perfect child and we (students at St Anne’s Parochial School) should all emulate her. Now, as ad adult, I can appreciate her beautiful, singular witness to God’s love and am voting for “The Little Flower” with all my heart. Me too. And so young when she died. The forthrightness of Martha appeals to me. I have always felt a kinship with her. I feel like Martha on several levels and hear Jesus’ message with a grateful heart. My post on Martha is way down on the list, but I need to say here that I think Martha has been misinterpreted and overlooked throughout church history. She may have been multi-tasking when we first meet her, but she was obviously a strong, smart woman, who I think sat down to listen to Jesus after he pointed out Mary’s desire to learn. Martha makes the greatest statement about who Jesus is, pre-ressurection, of anyone else in all the Gospels! Peter makes a statment that isn’t quite as strong, and he is labeled as the “the rock…” and considered the first pope. Martha makes a stronger statement of understanding about Jesus’ mission and identity and she is considered just a busy housewife? Where is the sense in that? Therese had symptoms of epilepsy. I admire her ability particularly during the times when illness was seen as a sign of wickednessk to convert these symptoms into cause for prayer and devotion. I did not know much about Therese of Lisieux until I studied her further than the brief biography given. Co-Patron of France with Joan of Arc, Co-Patron of Missions with Francis Xavier and only the third woman to be named Doctor of the Church. For me Therese of Lisieux is much more and worthy of my vote this morning. I am conflicted. I did somethign different. I was reading some info on both ladies last night ahead of time and I have decided to wait til later to vote after reading some comments. Information on these ladise is most appreciated as I never heard of Theresa before LM and know only a little about Martha. I am drawn to Theresa’s idea of “little ways” of showing the love of Christianity and yet I seem to connect with Martha on a personal plane. Laura thanks for excellent write up in your blog to go along with today’s LM!! Opps. I meant something differnt. Are typing errors catchy? Nancy: I find that I can’t spell after 6:00 p.m. and when the caffeine has left the system. My vote goes to the woman who says ‘ exactly what she is thinking ‘. Calling ’em like she sees ’em. Forgot to add the good woman’s name to my post–Martha, of course. And mine is the end of Jonah: “and also much cattle.” Gotta love it–poor cows! Therese of Lisieux – easily annoyed teenager who made the best of it. Seriously, she was the proponent of the “little way” which makes us all realize that it is the small things that count. My vote is for the Little Flower. …On the other hand, while Belgian monks make a fantastic ale, I hear the Carmelite nuns produce an absolutely fabulous low-fat topping for ice cream! And all we who fall asleep while praying DO need a patron saint. Anyone who has gone on a longed-for retreat, only to find some irritant distracting one from prayer… and then figures out a way to pray with and through the annoyance—- bravo! Therese- the patron of those of us who find the reality of a life of prayer hard work…. but perseveres. Go Terry! You almost convinced me to vote for Theresa. But, had to go with Martha. Because I relate to her flaws and admire her unhesitating faith and honesty, my choice today is Martha, Martha, Martha! I am a deacon, so Martha is a bit of a role model, as well as an object lesson, for me. I have to confess that I have never understood the merits of Santa Teresita to be considered as a saint. Well, for me saints are the members of the Ekklesia and in this regard she was a saint, so I mean the merits for her to be put on the altars. Both keeping it real, both working it out in the midst of the everyday, both struggling yet persevering, faithful and inspiring. Most difficult match to date. women in general are the caretakers. They serve the others. wives, mothers, eldest sisters, daughters often have no time for contemplation, everyone must eat. Martha did that and still knew that Jesus was the Messiah and she was committed to him. We find ourselves in that position often when the cares of day to day take over and it’s difficult to put them aside. Yes, Mary sat and listened to Jesus, but Martha fed him and his followers and made them welcome. My vote goes with Martha. I found folks’ devotion to Therese, and her way of following Christ, baffling until I studied her and her work. She took the spiritual practices and devotions of her time and moved them to another level, and in the process became someone admired by people as diverse as Thomas Merton and Dorothy Day. In particular, during her time of deep spiritual trial, she felt such empathy & concern for those who had chosen not to believe, that she offered to stay in complete spiritual darkness forever as a sacrifice in love for others’ salvation. Her experience of unbelief galvanizes her final act: her willingness to stay in the darkness in empathy and concern for those who have chosen it. A “little way” that is far from little. Offering to stay in spiritual darkness so that others might come to the light sounds rather like the Buddhist concept of the bodhisattva; the one who stays just this side of Enlightenment to show others the way. The ‘Martha vs. Mary’ battle took up a lot of time with my friends and me when I was a young Christian. My friends would claim to be Marthas and wished they were Marys, while I (silently) thought myself a Mary and felt they were (silently) wishing I would ‘help with serving.’ So here as best I can tell from outside reading on Therese, we have indeed a Mary/Martha battle. Very kind words spoken of Martha, here and at Infusion, but I still come out desiring the contemplative life, not the serving one. I’ll be interested to see how this comes out! Marthas of the world unite! Tough choice…Martha, down-to-earth, pragamatic, direct, seemingly the elder sister…and biblical figure…Therese, romantic, youngest sister, strong-willed…and “historical”…I like them both…but am reminded of Therese’s desire to be a priest in a time and a church where that was impossible. I think I’m leaning towards Therese…though I think she’ll be the low-vote-getter today! Martha – for grumpy and opinionated women everywhere! I am so torn. I have newly come to know St. Therese of Liseaux and love her as one of my Patron Saints. But I also belong to St. Mary and St. Martha of Bethany Episcopal Church and Martha is our Patron Saint. I’m going to have think on this a little more before I decide. This was a tough one for me. I so love Therese’s idea of “do small things with great love,” but I can’t help feel a personal and stronger connection to Martha. So it’s Martha all the way! Being an Altar Guild directress, I identify with Martha. I am sometimes mocked (lovingly?) for being so task oriented. But my two inner reflections are that someone has to do the work, and that all work is prayer. Never do I begin my duties without a prayer first,and never do I forget who it is that I serve. I don’t know if there is a patron saint of Altar Guilds, but if not, I nominate Martha. I am a Martha by name and by inclination. I have always thought perhaps it might be better if I was a little less Martha-ish and more Mary-ish. But after reading this morning’s offering, I am hoping that I can continue being Martha-ish: having the tenacity to continue to serve faithfully and lovingly whenever and wherever Jesus invites me. I have to say Martha as I feel like a Martha a lot and I honor her and her works. While the mystical part of me relates to and admires Theresa, I definitely identify with Martha, who while practical and living with the demands and challenges of real life still sees Jesus real and whole. If you think about it, was Therese that much different from Martha? Once she knew that she wanted only, and with all her heart and being, was to join the Carmelites, she was a girl with a mission! Mother Superior says “No!”? Next Stop, the Pope! What? He says “No!” Stage a sit-in! That said, I still feel a closeness to, and great empathy for martha, and so, she got my vote! While in some ways it’s so much easier in this day and age to identify with busy Martha, St. Therese’s simple wisdom may be what we need so desperately. “The Story of a Soul” is an extremely powerful little book. If you haven’t read it because you don’t think you can relate to a young, cloistered, 19th century, French, nun, I urge you to give it a try anyway. It is often those who are most hidden away who provide an example for others to strive to reach. Here’s to Therese. Absolutely Therese: has changed countless lives as one in a deliberate line of strong Teresas (Avila, Lisieux, Calcutta) whose influence continues to be incalculable on both men and women. Gotta comment that -as good as they usually are- this is the first LM writeup I felt undersold the real strengths of the saint. We’re not talking a stubborn girly-girl with a strong private piety and cute mini-reminders of God in daily life here. We’re talking a Doctor of the Church and a very formidable woman. I feel compelled to point out that I believe there is an error being promulgated here. It is Teresa of Avila who was a Doctor of the Church. She too was also a Carmelite. Avila deserves the honor of being named a doctor of the church. Avila wrote letters and books that are widely regarded as classics including The Way of Perfection (1573) and The Interior Castle (1577). She was named the first woman Doctor of the Church in 1970. No fair combining your saints, thereby doubling their chances of making it to the finals. You Episcopalians! Ask any old time strictly raised RC if you want to know the difference between the two Carmelites Theresa and Teresa. Me…I love them both but felt the need to clarify their accomplishments. From Catholic Encyclopedia: “John Paul II added St. Thérèse of Lisieux in 1997.” She’s a Doctor of the Church along with Teresa of Avila. Actually, BOTH Teresa of Avila and Therese of Lisieux are Doctors of the Church. Teresa of Avila came first, though! With all due respect to the sweet child Therese, my vote goes to my sister Martha, whose focus on the non-essential details of life I have shared so often. The lessons Jesus taught her in letting all that go and focusing on the spiritual have taught me as well, and I am grateful. Jesus went to Martha’s house which was always welcome and inviting. Imagine if our houses were always ready to receive Jesus! GO, Martha! Gotta vote for Therese – my husband’s great grandfather came from the Gelsemino, a.k.a. “Little Flower” orphanage in Northern Italy with only a first name. Ellis Island insisted on a surname so he took “Gelsemino”, the orphanage name, which was Americanized to Jasmine. Tough one! I’m always drawn to monastics and contemplatives – nuns especially – and I really like all the Theresa anecdotes today. I haven’t read “The Story of a Soul,” but will be doing that shortly. And I guess Martha’s playing the role of “active” here today, isn’t she? Normally I’d vote the other way, but Martha is such a great persona – not to mention a close personal friend of Our Lord and Savior. She’s a patron of single laywomen and travellers, among other things – and should be a patron saint of “friendship,” I think. So Martha got my vote today, although I almost went with the sympathy vote for Theresa…. I worked at a children’s home in Ft. Worth named after Therese, so I have to vote for her! but I have always loved Martha, too. Hard choice! got to go with Martha, remembering an essay by Edwina Gately called “Where are Martha’s keys?” She recognized the Messiah and served him admirably. I am Martha. Give me a minute here, and I will get snacks and tea for everyone while you are voting…. Love this! It made me laugh. I’m going for Martha, for all the women of the church offering hospitality, making coffee, washing the altar linens, cleaning up after the party, AND being the ones to greet Jesus and proclaim Him Messiah. It’s Martha all the way for me and I hope others here in Kansas, AKA Big Sunflower. Martha and Mary were the namesakes of an Episcopal girls school in Topeka that existed from 1870 to its close in 1928 — the College of the Sisters of Bethany. The value of such an important institution prompted a major gift of land from the founders of Topeka to the Diocese of Kansas as a home for the school. The diocese and Grace Cathedral now occupy this land, along with the majestic Topeka High School. I’m happy to support one of these sisters, a personal friend of Jesus who was could speak her mind to him. Go Martha! The story of the “clicking noise” spoke to me. To take something that annoying and turn it into a blessing. That is a women I hope to emulate. One of the dear nuns of the order of which I am an associate has taken the name Theresa, and she is a kind and gentle soul, who seems to have the same attributes as Saint Theresa. In light of those two facts, Theresa gets my vote. Got to go with my patron saint here. I believe her struggles were deeper and more complicated than The Story of a Soul conveys, but “little things with great love” is an incredible goal that gives all of us ordinary people a path. I have always loved Martha! She works at her service and recognizes that, although it would be swell to sit at the feet of Jesus, come lunchtime, HE and all the others would be looking for something to eat. Hooray for those who serve in real and tangible ways. Both delightfully, humanly flawed. Who hasn’t nodded off while in prayer. Who hasn’t had anger with God? God understands all and forgives. Isn’t that the Greatest Gift?! Today I go with Therese. Another day of great education. These two seem very similar.. Knowing nothing about either one, in a toss of the basketball at center court…. (Like March Madness…)Therese controls the jump, breaks away for a stuff. Besides that Carmelite’s rule. The holy fool votes for Therese. I am married to a “Martha” but her middle name is Carmel! Therese carries the day over the best supporting actress in Weekend at Bernies IV: Back from the Dead. This was a tough call. Both women were deeply human in their varied emotions and both were good examples to us in the way of serving Christ but I voted for St. Therese because as one commentator put it, roughly, serving is not my love language. Martha met Jesus. She knew the Apostle in the flesh. Little Sr. Therese knew him well in spirit and her book was defining the language is a bit out dated but read , at least excerpts. Nothing against Martha, but Thérèse of Lisieux influenced well known and respected modern saints such as Br. Roger of Taize’, Mother Teresa of Calcutta, and Jean Vanier who founded L’Arche. Catholics see her as one of only four female Doctors of the Church, and her legacy was shared in both Lutheran and Reformed seminaries as a positive legacy. I love her “little way” and her view of a tender, loving God helped transform my earlier deformed view. Her writings have helped me, so I’ll help her toward the Golden Halo – or at least try. She has my vote. A young child who has a religious experience and knows it is real–adults who pat her on the head and say “Come back when you grow up”–and her persistence and knowing that God has come to her–so familiar to me–I vote for Theresa. Vote Martha – for all those women whose work, service, and forthrightness have kept the church alive for the last 2,000 years!!! Poor Therese. I’m enough of a Martha to think she died of boredom at 23. Everybody wanted to be a nun at 12 or 13. Then you realized there’s a wild world out there and you want to be part of it. My own choice is to bring my acts of goodness out into the world, not to lock girls up forever. Yuck. I guess I don’t actually get the monastic life as a lifetime choice. Anyway, this girl’s for Martha all the way. About Therese’s early death: I was very touched to read that she believed she was dying young because God compassionately called her from this life prior to the age at which a priest would normally be ordained: because she so very deeply and wholeheartedly yearned to be a priest, and have the privilege of offering the eucharist. I knew nothing but the name of Therese, and that she had died very young–but Martha lives in my soul, always pulling at the Mary who lives there, too. No contest: Martha. I always thought Martha got a bad rap. Too bad Jesus or one othe disciples didn’t offer to help. In spite of my name, I am really a Mary at heart, and I don’t consider it one of my better traits. Martha is one of my faves.. sorry, Terry. Voted for Blessed Theresa – anyone who can make falling asleep in church a spiritual exercise has my vote. And for sheer tenacity in following her vocation…well that’s another great reason to vote for her. I harbor dreams of an alternate universe where the female disciples and followers of Jesus occasionally mentioned in the canonical texts actually were given the stature and respect they earned. If plainspoken Martha were instead the Keeper of the Gates, what would Christianity look like today? If I had read Mountain Lover’s comments on Therese before I voted, I might have changed my mind. But I cast my vote for forthrightness and I’m fine with that. I think that after Jesus suggested to Martha that it was okay to sit at his feet (like Mary was sitting at the feet of a rabbi indicating that she was one of his students) I think Martha took him up on it and that she became a student as well. Her statement of faith at Lazarus’s death doesn’t rival Peter’s, it surpasses it! Her statement – “Yes, Lord, I believe that you are the Messiah, the Son of God, the one coming into the world” – gives Jesus three messianic titles. Only a few others in the gospels name Jesus as the Messiah before the ressurection — and not one of them is as strong as Martha’s statement!!!! Go Martha!!! I cannot believe I just voted against my own bracket pick. I’ve read Therese, and loved her for years. She seemed like the clear winner. But the Celebrity Blogger completely won me over. I’d never thought of the parallel with Peter before, but it’s spot on, and it made me realize I’d been selling Martha short. My thanks to Celebrity Blogger Laura Toepfer for opening my eyes, and my deepest thank to all of God’s straight-talking, hard-working, bold-yet-humble women. Without you, the church would fall apart, and so would I.
i am really torn today. I can identify with Therese being told that her earliest spiritual experiences weren’t viable for whatever reasons. And although I am a Mary at heart, I get distracted and fret about what isn’t done and what I can’t control, and I too have been chastised for pointing out that I can’t see what God is doing and not fully believing in it. Martha’s proclamation of faith jumps out at me. Both women were true to their vision and understanding of God. Soul sister Martha all the way! As one of the people who makes the coffee every Sunday morning at church, I can relate to Martha. Just because you are setting out the coffee and cookies doesn’t mean you aren’t listening. I think Martha is worthy of the Golden Halo! After all, Jesus said, “Feed my sheep.” And Martha sought to fulfill his words. We should give thanks for all the Marthas of the world. I love the story of Mary and Martha because it clearly demonstrates, to me, that Jesus considered women worthy of instruction, worthy of learning, and worthy of a higher calling than housework…. in essence, worthy of being disciples. That said, I’ve also always felt that as much as Jesus said that Mary chose “the better part”, I bet he and his male followers still expected to be fed, and you know none of THEM went to help Martha in the kitchen. And meal preparation was really, really labor intensive in that time and place. (Have you tried preparing Mediterranean food? I mean, really!) Poor Martha was doing her best to serve the Lord, literally, and all she got for her troubles was a reprimand. The least we can do is vote for her now. You are so right. I have always been disappointed that Jesus didn’t tell Peter, James and John to get in that kitchen and start cooking. Being one who thinks best with busy hands I voted for Martha. I think she was listening to Jesus even as she prepared the meal and did the dishes. And when everyone went on their way I’ll bet she contemplated what was said while she was sewing. She clearly had done some thinking by the time her brother died. But I also loved the story of Theresa, falling asleep during prayers. I am impressed and inspired how she turned the annoying clicking into prayer – a wonderful model for dealing with many annoyances. And I agree with the idea that she showed signs of seizures – perhaps of a nature that was not noticeable to others – like absence seizures where you just blank out for a bit. The sleepiness comes after the seizure. I once went to a wedding suburban Detroit at a Catholic church called ‘The Shrine of the Little Flower’. Growing up Catholic, I knew that this was an atypical name for a catholic church, and imagined a building that was, well, small, 60s and hippy. Instead it was this nearly Gothic thing. I always wondered where the name came from, and now it all is clear! Thanks CB Neil Alan Willard for such an interesting writeup! I knew nothing about her and would like to learn more. However…. I’ve always felt sorry for Martha, even though there are some that would think me more of a Mary (besides the fact that it’s my name). Today she is the one that my heart is going to, although I admire the absolute faith of both women. This was a hard one – I was all set to vote for Martha (I am always fighting against multi-tasking) – and then read some comments about Theresa which gave me pause. Too bad I can’t vote for both. However, my vote will be Martha – my mother’s and my first name. Had to vote for Martha. Practical, get-the-job-done Martha. Martha who also needs regular reminders to sit down and sit still. Too much like me to deny her. Poor old Martha, attending to all the day-to-day stuff everyone else was too special to do, whether or not anyone appreciated it–which apparently they didn’t much. The ultimate patroness for us hardworking moms. Had to vote for her. As Jan on the Brady Bunch might have said, “Martha! Martha! Martha! Why is everyone always talking about Martha!” She always struck me as a competitive, passive-aggressive tattle tale who (to paraphrase) tells Jesus “I told you this was going to happen and you should have listened to me, BUT NO!” Yes, I suppose her forthrightness is refreshing if you like that sort of thing but she reminds me too much of my always-working-in-the-church-kitchen-while-making-nasty-comments-to-others-mother-in-law. I have read “The Story Of A Soul” three times. Give me the useless-in-the-kitchen, neurotic teen dreamer, mystic and lover of Jesus who pestered everyone around her to let her join a cloistered convent and then realized what she really wanted after all was to be a missionary and go to foreign lands and convert thousands to Christ. So she put all her faith in prayer and asked God for the impossible: to make her dream come true of being a missionary who spills her blood for Christ while keeping her vow in the cloister. And God answered her prayer. She spilled her blood in tuberculosis while writing down her spiritual autobiography. Her posthumously published writings about her little way of love have inspired millions all over the world for the last hundred years. And yet it was Martha’s home where Jesus went when he wanted to relax and be with friends. If, as the story in question relates, Jesus and his 70+ followers showed up for dinner (I doubt that number based on the size of an ordinary house, but for the sake of argument, say he did bring 70 men with him for dinner), who wouldn’t be asking for help in the kitchen?! And the story relates a sibling relationship . . . and anyone who has siblings knows that can be difficult! Ever have Thanksgiving dinner at your sister’s house? I love Martha, but I have to vote for my patron saint, Therese. The brand of overly precious 19th-century French piety that attends her image was never my cup of tea, and I was disappointed to see that notion of her played up, as per the usual, in her bio here. She is a Doctor of the Church, not just a cute little girl! The circumstances of her life did not allow for grandiose heroism, nor even for the opportunities Martha experienced in being able to serve Christ in person. Instead, Therese thought deeply and suffered willingly the obscure trials that most human beings endure, day-to-day. She had the inspiration to codify that common path as the “Little Way” to God. It looks unlikely at this point that she can win this showdown with Martha, but that’s OK! I have no doubt that she is rooting for her less patient predecessor! My vote goes for Martha. I admire Little Flower’s utter devotion to her faith and in some ways, I envy her knowing what she wants at SUCH a young age. I agree with Nancy, who replied earlier, that Therese must have died of BOREDOM at 24! There are so many other ways to spread goodness in the world. Anyway, Martha’s strength and “get the job done” attitude wins me over. I just love Martha’s spirit!! Ahhhhhhhhhhhhh, another day of Lent Madness knowledge. I was convinced to vote for Therese by the quote that “parents love their children while they sleep just as much as they do when they’re awake. In the same way, she knew that God loved her.” I have the same challenge and love her take on the issue. Seems to me that she was a “glass half full” kind of person and that her faith reflected that. On the other hand, I have never been a fan of Martha of Bethany. I am happy to learn more about the “little flower” — a reason I love Lent Madness to learn more about who came before us. However, I just relate way to much with Martha. And unlike a previous comment about her being a housewife, she reminds me very much of a deacon. I have a tendency to real Marthaness, so I voted for her. I saw in the New York Times Travel Section Sunday, that the 100th anniversary of Harriet Tubman’s death will be commemorated in both New York and Maryland, on March 9th. Did the SEC know beforehand? I despise Ste. Therese! A willful brat who probably was lying about the vision of Mary! Gotta go with Martha. Oooooh! Harsh! If a girl is going to be “a willful brat”, how nice that it is on the side of the angels, as it were. When god calls, how should we respond? Or God, for that matter! Don’t drag yourself any longer to His feet, follow that first impulse that draws you into His arms. That is where your place is. St. Therese pray for us! tough choice. both stories are beautifully written and teach us something new. Had to vote for Martha…. The little flower or the worrier … oh, my, just not sure which to go with today. A worrier and a doer whose trying to give up some of that in this phase of life, I’m tempted to vote in honor of Martha, but I do love the idea of Therese’s contemplative life. And, yet, a part of me feels sad for her … that she lost some of childhood in the process. Perhaps, however, she was called and had no choice. I’m still thinking on this one. Going with Martha – I am a Martha. Edwina gateley once pointed out that Martha acknowledges Jesus as Messiah in much the same words as does Peter. Peter gets the keys of the kingdom in reward – where are Martha’s keys? Thanks for this… this helped me decide. And, Peter was always messing up, but doesn’t nearly get held up as a model of what not to be as Martha has been. So, Martha – you get my vote. Martha never denied Christ. Peter denied Jesus three times in one night. I spent eight years hearing from Ursuline nuns about St. Therese at my elementary school. I don’t want to hear any more about her. Sorry, Therese, but you are already a saint, which is a pretty awesome thing. Be grateful for that… It’s time to vote you off the island. I grew up hearing quite a lot about “The Little Flower” and I too don’t want to hear anymore. She may have led a prayer life and that is admirable but quite frankly I suspect she may have been a few beads short of a Rosary. My vote went to Martha, she was a hardworking woman, who was very straight forward, spoke her mind and didn’t hesitate to stand up for herself..that’s why my vote went to her. I am like so many of you, torn between two different ways of being as shown in the lives of these two women. Not an easy choice at all. I think this write up failed to fully emphasize the influence of Therese on modern Christianity. Her focus on doing small things with great love was a new idea when Story of a Soul was published. The power of the writing of such a very young woman is truly impressive. She is revered by both great scholars, such that she was named a Doctor of the Church, and everyday individuals. The reverence by average people is so intense that in many Roman Catholic Churches, the only statues other than Jesus, Mary, and Joseph (and maybe the patron of the parish) are statues of St. Therese and St. Anthony, one of them by each entry door. Her certainty of faith and conviction to follow her calling from God despite the roadblocks placed in her way are admirable and a wonderful example of true devotion. Martha is one of the most vivid characters in the New Testament, but I have to cast my vote for Therese. Anyone whose faith and conviction in her call are sufficiently robust to withstand the daunting hoops and hurdles of rules and processes, the frustrating pettiness, and the withering arrogance of some in the upper echelons of a hierarchical church deserves to get my hearty affirmation. I’d like to learn which Teresa, Therese, or Theresa is really the Doctor of the Church. What are the requirements for that title? Can it be attained before one is 24? And what about the “little flower” being the gift of her father, actually? I am glad to hear about the snoozing, though. Did Martha ever get a nap? She reminds me of a neighbor of my youth, bossy and capable, who gave my sister and me each a carnation corsage when we had the measles and could only lie in a darkened room for days. According to the Catholic Encyclopedia, both St. Teresa of Avila and St. Therese of Lisieux are Doctors of the Church. There are only 35 of them. Augustine and Aquinas are probably the best known. Only 4 are women: Teresa of Avila, Therese of Lisieux, Catherine of Sienna, and Hildegard of Bingen. Some of them have special honorifics, eg Aquinas is called the Angelic Doctor. Therese is called the Doctor of Love. “In the 266 Lettres we possess, addressed to family members, women religious and missionary “brothers”, Thérèse shares her wisdom, developing a teaching that is actually a profound exercise in the spiritual direction of souls. I’m so sad that the woman who learned to pray THROUGH distractions is about to lose to the woman who gave in to the distractions. What a witness to those of us who struggle with focusing on prayer! Therese offers us a way through that toward the heart of God, while Martha offers us passive aggressive triangulating snark. I mean, not that I don’t love me some passive aggressive triangulating snark every now and then, but seriously….more often I need the reminder that it’s possible to turn my distraction and worry INTO prayer. I voted for Therese because she reminds me that there are many ways of serving God; some may seem small or obscure in human eyes, but they aren’t minimal to God. I had to vote for “Sveti Mala Terezija” as she is known in the former Yugoslavia. My time as a voter registration supervisor in Bosnia some years ago took me to the village of Debeljaci where I passed by the ruined site of the church that had borne her name. A sad sight in a sad place. While I truly admire Therese’s tenacity and willingness to heed her call, as well as her devotion in small things, the cloistered life is not so relate-able to me. Today I am running my business from my home office so I can get all the laundry done, make a test batch of granola for my bakery, update the website, file a knee-high stack of papers, and get dinner started. As a young woman desperately trying to practice servant leadership for my employees, customers, family, community, and church I can easily relate to Martha’s attempts to run her household, entertain her guests, and listen to her messiah. I struggle with meeting my responsibilities and obligations while also making myself STOP and listen to God. I’m ashamed to admit that while I admire Martha, I’d never realized the significance of her statement of faith until today. My admiration has increased ten-fold. And as someone who serves for a living, I have to vote for the patroness of waiters and waitresses. Martha for the win! Kat, I’m with you all the way (and yours is oh such a long way). Like you, I never appreciated Martha’s powerful statement of faith until today. I’m a newly-minted Martha fan, and not the only one, judging from the comments. I’ve always wondered if Jesus rebuked Martha before or after he had enjoyed the meal she prepared for him and all his friends. For me, it’s Martha all the way. The Little Flower struck me as being a little too precious, even when I was a young girl. While “The Little Flower” is sweet, precious and certainly a wonderful example of “and a little child shall lead them”, I have to go with Martha, who always seems to get the short end of the stick when it comes to respect and recognition of a truly remarkable care giver, who is also a spiritually enlightened soul pre-touched by the Holy Spirit.. before Peter had a clue…so to speak. Go Martha!! Martha because I can certainly identify with her–even if on too many days I’m more a Mary. And she provides a dose of reality to the Gospel stories in which she plays a part; that’s a real gift, especially as we move through Lent. I have always been drawn to the way women in the gospel stories drew Jesus into deeper recognition of the truth of his ministry – from Mary at the wedding in Cana to the Canaanite woman and the crumbs under the table. I have always viewed Martha in this way. She modeled service, and I believe Christ learned as much from her as she did from him. God can be present in the multi-tasking as long as we are centered on the true Lord of all. As much as Laura Toepfer made Martha into a real human being with great depth, I had to go with Therese. Partly because she was losing so heavily but mainly because she “bloomed where she [finally] was planted.” I particularly appreciated her taking the “noisy nun” and turning the distraction into music and from thence into prayer. I believe (and have this on pretty good authority) that Jesus wept out of sheer frustration that his followers still did not understand that death here is merely the beginning of life eternal. Jesus wasn’t weeping for Lazarus — he raised him back to life. Martha literally went toe to toe with Jesus…Who else would have had the nerve to stand there and say “If you had been here…..” Dreamers dream and we get hungry and discover they forgot to even defrost the turkey…Martha probably rung it’s neck, scalded and plucked and cooked it while you-know-who just sat in rapture at His feet. Y’all know who got my vote! Today it is Terese who speaks to me: in the chaos of events in my life, she reminds me to seek and find God in the little things, and to offer (or try to!) annoyances to God. Have to go with Martha as the first verger! I was named for Therese in a time when she was a popular ‘new saint’. I now realize that my mother identified with her, her mother also having died when she was young, and my mother also leaving her father whom she adored to come to another country- for her America, for Therese Carmel. Hearing about her through my childhood, I admired her and saw her as my life’s guide, but later came to regard her as mentally questionable. Why didn’t she speak her mind to the sister who kept splashing her with water in the laundry or made noise in the chapel? And then, as a senior adult, I read “The Story of a Soul”, and I got her. She was passionately in love with God, and lived that love with every breath. I have made my apologies, and am resisting the urge to vote for her more than once to make up for my years of disdain for my wonderful namesake. Two of my all-time favorites (Teresa of Avila and John of the Cross) were both Carmelites so I have to go with a fellow Carmelite – Therese of Lisieux. After reading a lengthy article on Therese I was still wondering what she did to deserve such admiration and sainthood. Neither she nor Martha had any “wow” factor. I do wish I were able to tolerate clicking dentures and smacking gum better. That’s certainly an accomplishment for Therese but not enough to win my vote. Martha is pretty much a minor player but she was able to voice her complaint to Jesus. Pondering Martha’s story brings to mind Joan Crawford cast in the title role. I will vote for her based on her gumption. It probably doesn’t matter because there are some pretty strong contestants who will crush either one. both speak to the way that the pebbles in your shoe can do more to slow you down than the boulders. Martha continually reminds me to use the skills and gifts I have and to worry less about what others do or fail to do. So Martha! When I have company I am always buzzing around and not enjoying my guests so I feel sympathy with & for Martha. Also I have a tendency to be too blunt or put my foot in my mouth, so the post citing the King James Bible’s translation “he stinketh” resonated. On the other hand I have been known to fall asleep while praying. It’s just a tough choice – but Martha is so REAL. Double insult! I invite you to read the entire 11th chapter of John. In this it is obvious that the house in Bethany was a safe house for Jesus and his troop when he was wazzed out with events in Jerusalem, a few miles a way. Martha and Mary hosted organizing suppers – what do you think is going on in that scene? – and were central to Jesus mission: It was to Martha that Jesus first revealed himself as the Messiah. Of course He wanted Martha to sit down and be his disciple! Supper was great, but hey! Women are to be disciples, too! The community organizing, the suppers, the safe house… all have to be a consequence of being a disciple, not a substitute! So ease yourself, Sister, and hear what I have to say. George, give Martha your seat. Today’s match clearly separates Episcopalians and RCs. The Little Flower is a much beloved and popular RC saint, many girls were named after her or chose her name at Confirmation. She would win in a landslide among Catholics. Just when I was starting to think we aren’t so different after all…. The story of Jesus’ visit to Martha and Mary’s house is my favorite Gospel story. I identify with Martha. Stuff needs to be done, so do it. So simple. And the reasonable reaction, “Lord, tell my sister to get of her duff and give me a hand with all this pottery!” Sweet and flowery is nice, but honest and direct gets my attention every time. hard choice. But love Martha’s outspokenness in an era and culture in which women were supposed to be quiet. She had the courage to express what she felt to Jesus and the steadfastness to accept his correction: pretty good way to observe Lent I’d say. Therese whomped the church’s rigid ideas of salvation (in the age of strict Jansenism) with the notion that Jesus loved us, poured out grace on us when we didn’t have a deserving bone in our bodies, and took all the little annoying events in life to think of herself as an instrument Jesus’ love. She was a strong, gritty young thing, made even more lovable because she asked for eclairs as a treat just before her gory death. Love her and have loved her since childhood.! Go Little Terry! I might have to get out a coin to flip… This is hard! I had never heard of Therese, and I don’t know how to put those funny little marks above her name, so thank you, LM, for helping me learn something today! I also wanted to be like The Little Flower when I was young. I do agree that many Roman Catholics would choose her over Martha…I like Martha too though. Martha for me. It’s funny that when I read the two descriptions I thought to myself “you have to be Roman Catholic to truly appreciate Therese.” Then I read the comments and I see I was not alone! I never saw what Therese did to deserve sainthood, not that that took away anything from her model of devotion. I was always a bit suspicious that she was a made a saint to recruit young women women to join convents. This is no reflection on her goodness and sweetness, just her importance. I agree with Beth that Therese’s bio did not bring her to life or really hit home what her contributions to the Kingdom were, and why she is a saint. As an Episcopalian who dearly loves her (along with Teresa of Avila from…what, 350 years earlier and in Spain?) Martha is wonderful, but Therese opened my eyes. Wow. Just wow. Did I invite all those smug comments about Martha? “Who would have fed Jesus and all his disciples?” Oh, that’s right, THERESE would have, and she wouldn’t complain about her sister in the process. I know she will lose but, it is a shame. “DO SMALL THINGS WITH GREAT LOVE”!!! I appreciate Therese. I have no doubt she had seizures as teen; she had all the classic symptoms, but I had to go with Martha. I just finished Jose Saramago’s The Gospel According To Jesus Christ and I have a new insight into her. Oops. It’s past my bedtime William. If you meant Avila, I’m too tired to google or go to my bookshelf, and my weary mind can somehow not subtract mid 16 th century from early 21st. Ha-doy! Definitely Martha. We all have to cook and clean sometimes. And she was the one who showed such faith when Jesus arrived late after Lazarus’ death. She rushed out to meet him and engaged him. No one forced Little Therese into the Carmelite life. She chose the cloistered life. She had health problems and died young, but not before writing a book that helped generations to see Christ. Martha knew Jesus and felt comfortable enough with him that she asked to intervene with her sister Mary. Martha recognized Jesus’ authority though he was not a family member. It’s not important that Martha or Peter was First to recognize Jesus as The Messiah. It is important that Jesus Christ was recognized by more than one person in more than one place at more than one time. John the Baptist, Andrew, Martha, probably Mary and Lazarus, and even the demons who were sent into the herd of swine recognized Jesus as the Son of God. There were others, too. Personally, I always wanted to be sister Mary who “chose the better part” to sit and listen to Jesus. But, who was going to get the dinner on the table if sister Martha didn’t do it? So, I felt that tension in my real life. I voted for Martha. I clean up the refectory after our meals. I can relate to Martha. The interactions between Jesus and Martha remind me of the Hepburn-Tracy or Doris Day-Rock Hudson movies, where they start out disliking each other and then fall in love.